As some of you may have known, I have been the proud holder of a stand-up Millipede game since I got my apartment in the summer of 2000. I say "holder" because it's not mine, but my brother's, but since I had the room for it and he didn't, I took it. 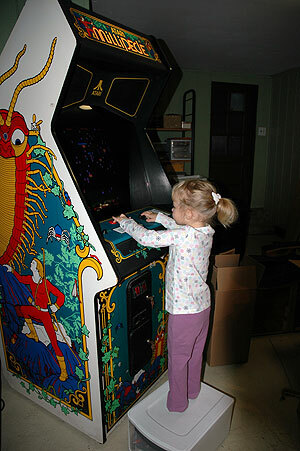 It was integral in my overall apartment design scheme, an awesome conversation piece, and had extra sentimental value to me since Millipede was the first arcade game I remember playing on my own at Bill's Luncheonette. The day I always knew would come came a few weeks ago on the eve of my brother and his family's move to Pennsylvania. Gamer came over early that Sunday morning, and the three of us packed the machine in his Cherokee. I couldn't help but shed a tear; not for it leaving but for how it was so symbolic of how strong the relationship between me and my brother is, and how awesome it has been to have him so close, especially while starting out my life. Gamer and I have been emailing, and have probably been in as much contact as we would be if he still were in the area, but nevertheless, it's not the same. That's my niece right there. Daddy and Aunt are very proud.